The Americans with Disabilities Act (ADA) defines a service animal as any dog that is trained to perform a task for a person with a disability. Service animals may be used to assist people with physical, psychiatric, sensory, intellectual or mental disability. The service animal is trained to perform certain tasks specific to the person’s disability. Tasks may include pulling a wheelchair, retrieving items, alerting a person to a sound, reminding a person to take medication, or pressing an elevator button. The ADA does not recognize emotional support animals, comfort animals, and therapy dogs as service animals under federal law. These animals often provide companionship, relieve loneliness, and can help with depression, anxiety, and phobias. However, these animals are not task-trained and limited to working solely with people with disabilities. Therefore, support animals are not federally recognized under the Americans with Disabilities Act. 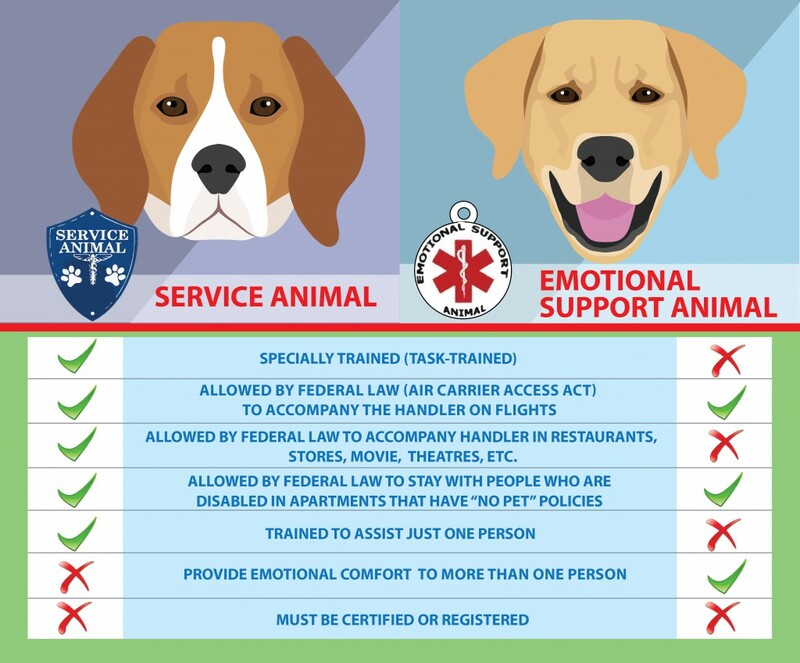 We have included a visual above to help distinguish the differences between service animals and emotional support. The infographic can be found on the blog, healthy paws pet insurance.